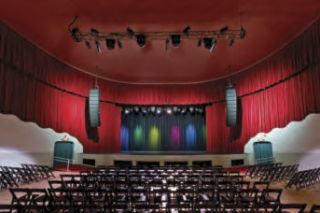 With the Ridglea’s seating capacity of 1,350, ASA Audio decided on nine NEXO GEO 1210s per side, one S1230 per side on the bottom, and six RS18s for subs.Opened in 1950, the historic Ridglea Theater in Fort Worth, TX is on the way to reliving its original glory as one of the city’s most treasured entertainment venues. Initially, it was a premier movie house, featuring classic films of decades passed. In the late ’90s, this legendary 20,000-square-foot jewel became known for hosting many locally and nationally acclaimed bands. Its 70-foot sandstone tower has been a long-standing iconic landmark for the west side of the Dallas-Fort Worth Metroplex. In 2010, Jerry Shults, a Dallas-based entrepreneur and restoration specialist, bought the Ridglea Theater, saving it from demolition. Thanks to his tireless efforts, he has transformed the theater into a marvelous multipurpose center for the performing arts and events. It has been restored to its original beauty highlighting all of its unique Spanish Mediterranean elements. The lobby boasts a 2,100-squarefoot mural by the celebrated artist Eugene Gilboe, depicting Spanish Conquistadors arriving on the coast of California with pirates in close pursuit, a fitting subject for a venue intended to fuel the imaginations of its patrons. Shults’ meticulous restoration has resulted in the theater being listed in the National Register of Historic Places, ensuring its survival into the future. Sound Productions of Irving, TX , provided the audio equipment as part of the system refurbishment completed by ASA Audio, also of Irving. Started in 1987 by owner Arthur Stephens, ASA Audio has expanded its operations to provide sound systems and lighting for private and corporate events, installations, arena shows, and festivals. The Ridglea Theater plans to be an integral part of the performing arts community, both locally and nationally. It is an ideal venue for live music, dance, and drama, as well as events such as corporate functions, meetings, receptions, charity events, and film festivals. Local and national bands will continue to make their mark on this symbolic stage with acts that feature Americana, blues, alternative rock, big band, and more.